Question: Why do rocket nozzles open wider at the end than, let's say, get narrower? I recently learned from random internet sources, that a jet engine works by having this amazing thing called a combustion chamber. The combustion chamber ignites the air to expand it, thus, causing more thrust. And most jet engines (such as turbofan engines) increase the amount of thrust by simply having the engine get narrower as you get behind. (i.e hole getting smaller). But for rockets, the nozzle gets larger and larger. Such as below. The purpose of this nozzle is to achieve maximum acceleration of the flow to obtain the highest possible exit velocity. The shape of convergent / divergent (de Laval) nozzles is dictated by the thermodynamic properties of gases. For a subsonic gas flow, a converging passage accelerates the flow. The physics are opposite for supersonic flows: they are accelerated by a diverging passage. So the relatively short converging portion of the nozzle you see is where the flow accelerates to supersonic speed in the throat, then the long diverging portion accelerates the supersonic flow. Where you cut the nozzle off depends on what you want the nozzle exit plane pressure to be. The gas at the narrowest part (the throat) of a convergent-divergent nozzle used in a rocket engine is ideally moving at the Mach 1, the speed of sound. This creates a choked flow condition. After the throat, the gas expands, the temperature drops, and because of the Venturi effect, it speeds to beyond Mach 1. A convergent-divergent nozzle thusly converts some of the thermal energy in the exhaust into kinetic energy. There are limits to the extent to which a rocket can convert that thermal energy into kinetic energy. A rocket operating in vacuum could, in theory, convert almost all of that thermal energy into kinetic energy. The exhaust would leave the nozzle at close to zero Kelvin, and with the exhaust being almost perfectly columnated. This would however require an infinitely long nozzle. At some point, adding to the nozzle becomes a net detriment rather than a benefit. A rocket operating in the atmosphere ideally has the exit pressure equal to ambient. Increasing the nozzle beyond this ideal results in back pressure by the atmosphere against the rocket, while decreasing the nozzle below this ideal results in decreased exit velocity. What about aircraft? Subsonic aircraft don't use a convergent-divergent nozzle because the flow isn't choked. There's a performance penalty to be paid for flows that exceed the speed of sound. That is a price that must be paid to escape the Earth's atmosphere and go into orbit. Some hypersonic aircraft do use a convergent-divergent nozzle, but it's often hidden inside the engine. The nozzle is a conical shape that is widest at the throat and tapers toward the rear of the engine. Instead of flowing through the nozzle, the exhaust flows around the nozzle in a jet engine. The combustion of propellants is an exothermic process, it mainly provides heat. Initial velocity (think of the turbo pumps) and the changed specific gas constant of the combustion product are negligible. Heat also translates into pressure via the gas law. Heat and pressure are somewhat useless once the exhaust gas does not interact with our rocket any more. They are lost when the gas mixes with the atmosphere or simply expands in empty space. The fact that these processes are irreversible is expressed as an increase in entropy. Only momentum of the gas provides thrust and that is proportional to velocity. The task of combustion chamber, choke and nozzle is to convert pressure into velocity efficiently in an adiabatic expansion. For good thermodynamic efficiency, the gas flow should be isentropic (but the stagnation point shifts depending on ambient pressure and speed, so it's always a compromise for ascent stages). This design goal dictates the form of the exhaust duct. For a subsonic flow, a narrowing duct will generate backpressure, effectively reducing the pressure at the choke and increasing velocity (Benoulli's principle). Backpressure does however not work for supersonic flows. The pressure will simply not propagate backwards, instead shockwaves would build up. The optimum profile of a duct does therefore have its narrowest point where the flow reaches Mach 1 and does widen after that choke. A formal derivation of this fact from the state equation for a compressible fluid flow can be found here. Physics.SE also has an answer on the theoretical background. Aircraft capable of supersonic cruise also have convergent divergent nozzles, because they need to generate a supersonic exhaust flow to maintain their speed. Note that supersonic nozzles can be used for subsonic movement (as is the case for a rocket at liftoff) but not the other way around. You're missing one thing: the combustion chamber (hidden behind the piping at the top of the photo). Pc is large, so if you want to make Pe equal to Pa, you need a nozzle opening much larger than the throat (the spot where the combustion chamber meets the nozzle). As explained there, the exhausted mass is constant but its parameters aren't. At the entry of the nozzle, the gas is hot and has a very high pressure. At the output of the nozzle, the pressure is a lot smaller (as it's the one from the atmosphere or space). The nozzle is used to expand the exhaust gas from that high pressure to the very small external pressure. Pressure and temperature are related to velocity. Hence, reducing the pressure allows to gain in exhaust velocity and thus in thrust. You will also notice that the nozzle is bigger on second stages than on first stages because of the difference of pressure of the environment (atmosphere versus space). 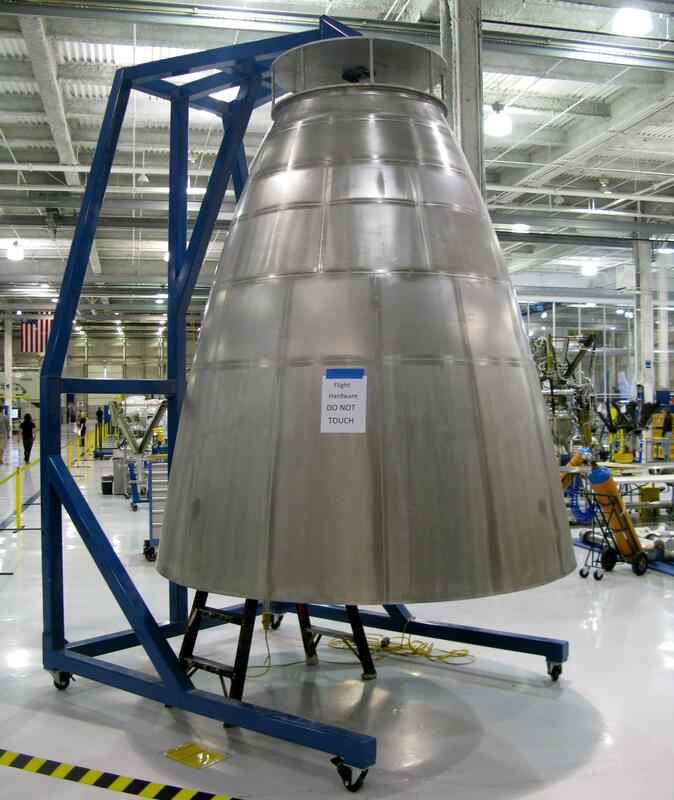 The role of the combustion chamber is to burn as much of the fuel+oxidizer as possible; never discard any unburnt fuel or oxidizer because it had to be carried there at huge expense of fuel and oxidizer earlier - every gram counts. Jets carry only fuel, they have air available in abundance, so as long as all fuel is burnt, surplus of air not having reacted with the fuel doesn't hurt - and actually helps; heated it expands and provides thrust, without need for huge exhaust velocity which would be hard on the turbines; more gas expanding by less, instead of a small amount of gas expanding by a huge factor - in rockets a tiny amount of mass provides a lot of thrust. In jets, the amount of mass carried by the plane is even smaller, but the mass providing thrust - intake air - is much larger, the airplane over a single flight pushing many times its own weight in air through the engines. And then there's aerodynamics. Refer to this question. 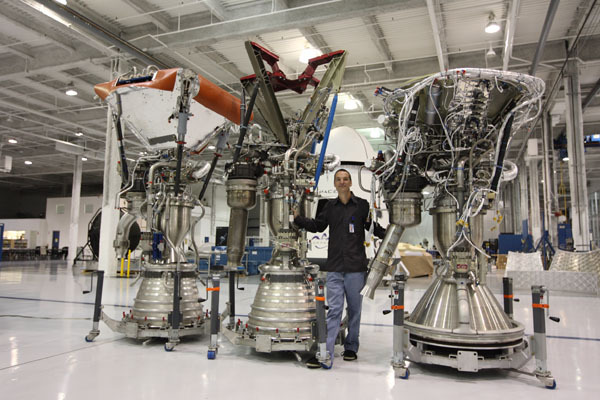 The two engines on the left have nozzles for atmospheric use. By the time the exhaust gas reaches the opening, its pressure isn't much higher than atmospheric, and it can't provide much more thrust. And this is the bell nozzle attached to the third of the above engines - meant for vacuum. Every last bit of momentum is squeezed from the exhaust gas, which would otherwise escape uselessly sideways. Installing such a thing on an airplane would be completely counter-productive because the huge nozzle itself would introduce so much air drag (through its outside in the air stream) it would completely nullify all the benefits. Although, your question does have a significant merit. Nothing beats the bell nozzle in void; it's the most efficient way to harvest momentum out of gas expanding into void. But bell nozzles for atmospheric engines are a crutch, an unoptimal reduction of the void bell nozzle problem to border conditions of the atmospheric pressure. They work, they work well, but they don't work optimally. 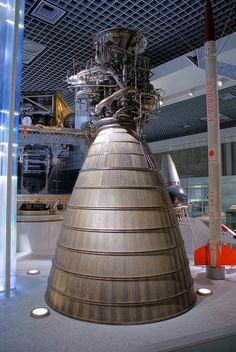 The counterpart of the nozzle of an airplane jet engine in rocketry is the Aerospike engine. Video of aerospike in action. 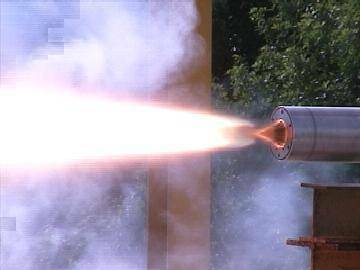 The aerospike is definitely superior to bell nozzle in atmospheric conditions. The problem though, is that large-scale implementation of aerospike engines would require a lot of new research, while bell nozzles are 'tried and true', tested, well known and readily available. And so, because nobody wants to pay for "being the first", we're still stuck with bell nozzles for atmospheric rocketry. Not the answer you're looking for? Browse other questions tagged rockets nozzle combustion . Why are exhaust nozzles in space shaped the way they are? How is chamber pressure and temperature determined for cold gas thrusters? new nozzle design, is it a fail? Why does the pressure & temperature ratio in a diverging nozzle continue decreasing once it hits supersonic flow? Is there a diagram of different nozzle diameters to scale?